Breast cancer comprises a heterogeneous group of malignancies derived from the ductal epithelium. The microenvironment of these cancers is now recognized as a critical participant in tumor progression and therapeutic responses. Recent data demonstrate significant gene expression and epigenetic alterations in cells composing the microenvironment during disease progression, which can be explored as biomarkers and targets for therapy. Indeed, gene expression signatures derived from tumor stroma have been linked to clinical outcomes. There is increasing interest in translating our current understanding of the tumor microenvironment to the development of novel therapies. Breast cancer is the most common malignancy and the leading cause of cancer-related death in women worldwide . Whereas localized disease is largely curable, metastatic or recurrent disease carries a dismal prognosis. The tumor microenvironment is now recognized as an important participant of tumor progression and response to treatment. As a result, there is increasing interest in developing novel therapies targeting the microenvironment, particularly as it relates to invasive and metastatic progression. The normal breast duct consists of a luminal epithelial cell layer surrounded by myoepithelial cells, which produce and attach to the basement membrane. The breast microenvironment is composed of extracellular matrix (ECM) and numerous stromal cell types, including endothelial and immune cells, fibroblasts, and adipocytes (Figure 1). Early work investigating epithelial-mesenchymal interactions in tissue differentiation demonstrated that embryonic mesenchyme strongly influences the terminal differentiation of both embryonic and adult epithelia . The influence of ECM is also observed in cell culture whereby normal mammary epithelial cells in laminin-rich three-dimensional matrix form acini with a central lumen, become responsive to lactogenic hormones, and are capable of producing milk proteins [3, 4]. 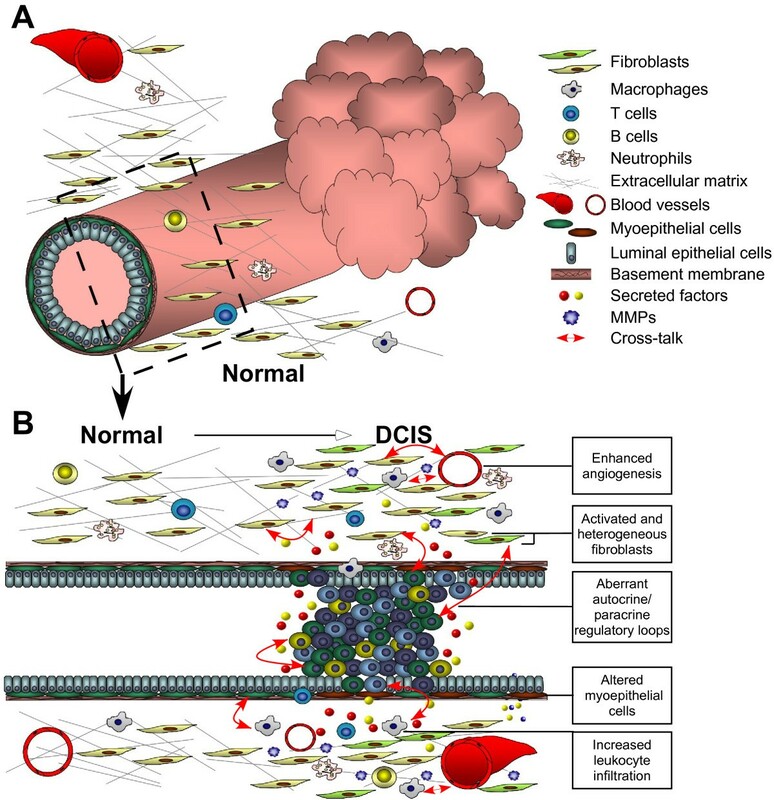 Components of the microenvironment, including macrophages, myoepithelial and endothelial cells, and several ECM molecules, have been shown to play critical roles in mammary duct morphogenesis . Similarly, the tumor microenvironment is increasingly recognized as a major regulator of carcinogenesis . For decades, pathologists have appreciated the wound-like appearance of desmoplastic tumors, including some breast carcinomas. The now-famous assessment by Dvorak that 'tumors are wounds that do not heal' is being redefined at the molecular level as the role of the tumor microenvironment in cancer progression is elucidated . Alterations of the microenvironment from normal duct to in situ transition. (A) Schematic (transverse) view of a normal breast duct composed of a layer of luminal epithelial cells encircled by myoepithelial cells (green) and surrounded by a continuous basement membrane. Stroma containing fibroblasts, immune cells, and vasculature surrounded by the extracellular matrix maintains the normal tissue structure. (B) Longitudinal view of the normal duct and in situ carcinoma. In ductal carcinoma in situ (DCIS), epigenetically and phenotypically altered myoepithelial cells (shown as brown cells) are surrounded by a still largely continuous basement membrane. Altered myoepithelial cells in DCIS are unable to aid polarization and organize the structure of the normal duct. At the same time in the stroma, the numbers of fibroblasts and infiltrated leukocytes are increased and angiogenesis is enhanced. Cancer-associated fibroblasts (shown as yellow-green fibroblasts) and infiltrated leukocytes elevate secretion of growth factors, cytokines, chemokines, and matrix metalloproteinases (MMPs) to promote tumor progression. Potential cross-talk between cell-cell and cell-matrix interactions are aberrantly regulated by both autocrine and paracrine networks of proteolytic enzymes, cytokines, and chemokines (red arrows; not all possible interactions are indicated). Interactions between stromal and cancer cells may interact with each other via paracrine signaling rather than direct cell-cell contact. Breast tumors evolve via sequential progression through defined stages, starting with epithelial hyperproliferation and progressing to in situ, invasive, and metastatic carcinomas . Both clinical and experimental data suggest that ductal carcinoma in situ (DCIS) is a precursor of invasive ductal carcinoma (IDC; Figure 2A, B) [9, 10]. DCIS lesions contain proliferating neoplastic cells confined to the duct (Figures 1B and 2). A critical, but poorly understood, step in breast cancer progression is the transition from in situ to invasive ductal carcinoma, which is defined by the loss of myoepithelial cell layer and basement membrane (Figure 2). The subsequent spread of tumor cells to distant sites results in metastatic disease. Importantly, the tumor microenvironment has been implicated in each of these steps of cancer progression. Alterations of the microenvironment in breast cancer progression from in situ to invasive carcinoma. (A) Schematic (transverse) view of the ductal carcinoma in situ (DCIS). Although the ducts are enclosed by the altered myoepithelial cells surrounded by the basement membrane, the multiple cell types of the stroma of DCIS have dramatically changed to create a favorable tumor microenvironment. (B) Longitudinal view of the duct from DCIS to invasive ductal carcinoma transition. Invasive ductal carcinoma (IDC) is defined by degradation of the basement membrane, loss of myoepithelial cells, and invasion of epithelial cells into the stroma and vasculature. Tumor cells invade into the local environment due to the loss of the structural duct and autocrine/paracrine signaling that activated cell migration. 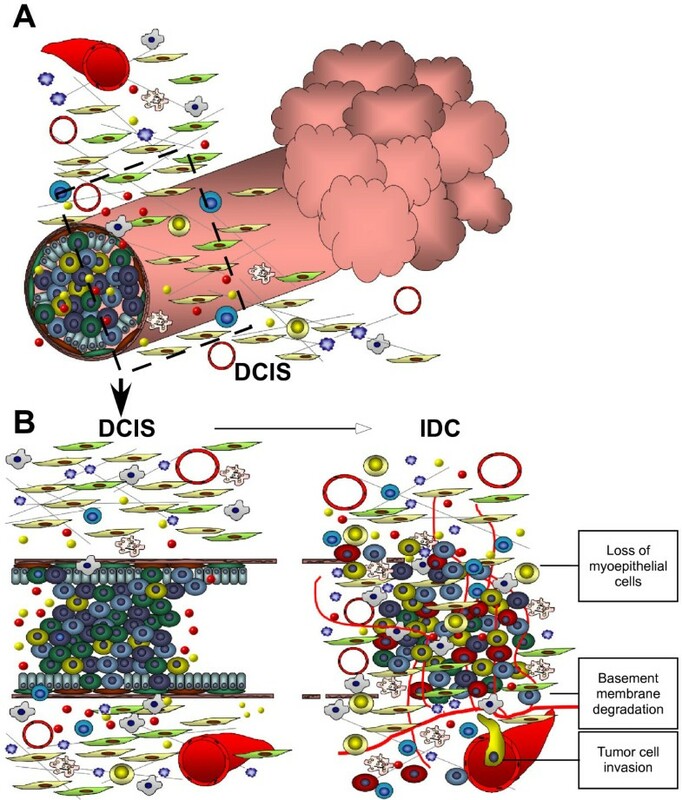 The production of extracellular matrix-degrading proteases by the tumor cells and stromal cells is elevated during the in situ to invasive carcinoma transition, leading to destruction of the extracellular matrix such that the tumor cells can invade locally and release more secreted factors. Aberrantly secreted proteolytic enzymes, chemokines, and cytokines continue to attract leukocytes, modulate tumor remodeling, and increase tumor cell invasion to distant organs, eventually leading to metastasis. In a pioneering study, Allinen and colleagues  isolated multiple cell types from normal breast, DCIS and IDC lesions and analyzed their gene expression profiles using serial analysis of gene expression (SAGE). In addition, genetic changes were detected by cDNA array comprehensive genomic hybridization and single nucleotide polymorphism arrays. The results of this study demonstrated altered gene expression patterns in each cell type analyzed during breast cancer progression. Myoepithelial cells from normal breast tissue and DCIS had the highest number of differentially expressed genes. A significant fraction of these encode secreted proteins, suggesting the activation of aberrant autocrine and paracrine regulatory loops. Many of the genes involved in normal myoepithelial cell differentiation and function were downregulated in DCIS-associated myoepithelial cells, including those encoding laminin and oxytocin receptor, whereas genes that promote tumorigenesis were increased, including CXCL12 and CXCL14. Importantly, clonal genetic aberrations were only identified within the malignant epithelium. Although some controversy remains regarding the existence and relevance of genetically abnormal stromal cells in human breast cancer, the majority of data support the hypothesis that gene expression and functional changes observed in the tumor microenvironment are not due to genetic alterations. In a related study, Ma and colleagues  utilized laser capture microdissection and cDNA microarrays to analyze the gene expression profiles of patient-matched samples of normal- and tumor-associated epithelium (DCIS and IDC) and stroma. Again, the most dramatic gene expression changes both in the stromal and epithelial compartments were observed in the normal to DCIS transition. However, several ECM-degrading proteases, including matrix metalloproteinase (MMP)2 and MMP14, showed elevated expression during in situ to invasive carcinoma transition, which may play a role in the destruction of the basement membrane. One limitation of this study is that the different stromal cells were not individually isolated prior to analysis. Additionally, laser capture microdissection is unable to separate luminal and myoepithelial cells and to fully isolate stroma from epithelium. In fact, the authors noted that the majority of genes with increased expression in IDC compared to DCIS epithelium were likely the result of stromal cell contamination. Tumor-associated stromal cells maintain their altered phenotype in cell culture during prolonged passage , indicating hereditary changes such as epigenetic modifications, as genetic alterations are very rarely detected . Hu and colleagues  tested this hypothesis by analyzing the comprehensive DNA methylation patterns of multiple cell types from normal breast tissue, DCIS, and IDC using methylation-specific digital karyotyping. Significant methylation changes were identified in each cell type during tumor progression. These data imply that epigenetic modifications are at least in part responsible for the altered phenotype of cells composing the microenvironment in breast cancer. The key characteristic of invasive progression is the loss of the myoepithelial cell layer and basement membrane (Figure 2B). Studies utilizing both in vitro co-culture and xenograft models have demonstrated that normal myoepithelial cells inhibit tumor growth. To better characterize the role of myoepithelial and stromal cells in the transition from DCIS to IDC, Hu and colleagues  utilized the MCF10DCIS.com xenograft model, which forms DCIS-like lesions that spontaneously progress to IDC with histological and molecular characteristics resembling human lesions. Co-injection of normal myoepithelial cells efficiently suppressed the growth of MCFDCIS xenografts and the transition to IDC whereas fibroblasts had tumor growth and progression-promoting effects. Gene expression profiling and immunohistochemical analysis of luminal epithelial and myoepithelial cells from MCFDCIS xenografts and human breast tissues have identified transforming growth factor β (TGFβ) and Hedgehog pathways as specifically expressed in myoepithelial cells, implying an important role in these cells. Correlating with this, downregulation of TGFBR2, SMAD4, or GLI1 in MCFDCIS cells resulted in a decrease in myoepithelial cells and enhanced progression to invasion. These studies suggest that the loss of myoepithelial cells promotes DCIS to IDC transition. The mechanism by which this loss occurs in human tumors is unclear. One hypothesis is that the differentiation of myoepithelial progenitors to fully differentiated myoepithelial cells is compromised due to signals emitted by tumor epithelial and stromal cells. The identification and characterization of these paracrine factors may lead to the development of novel therapeutic approaches for the prevention and treatment of invasive breast cancer. Normal fibroblasts maintain the extracellular environment through the production and remodeling of the ECM. Carcinoma-associated fibroblasts (CAFs) have distinct characteristics and substantial data support a role for CAFs in promoting tumor progression. CAFs are themselves heterogeneous, with a subset of them identified as myofibroblasts expressing alpha smooth muscle actin (αSMA), others expressing fibroblast activation protein (FAP), desmin, S100A4 protein, and Thy-1 . Orimo and colleagues  demonstrated that CAFs promote tumor growth and increase tumor angiogenesis by secretion of stromal derived factor (SDF)-1/CXCL12, which acts in a paracrine fashion to increase tumor cell proliferation via CXCR4. Hepatocyte growth factor (HGF), acting through the c-Met receptor tyrosine kinase, is another CAF-derived factor that has been implicated in promoting tumor progression and metastasis. The paracrine activation of c-Met on tumor cells by HGF increases invasion of experimental DCIS lesions in xenografts . Interestingly, co-culture of normal mammary fibroblasts with breast cancer cells can 'educate' the fibroblasts to secrete HGF and increase their tumor-promoting activities . The origin of carcinoma-associated fibroblasts has been actively investigated and multiple hypotheses have been proposed. One possibility is that they are derived from native interstitial fibroblasts whose phenotype has been modified by persistent aberrant signaling from neighboring tumor epithelial cells. Alternatively, they can be differentiated from bone marrow-derived mesenchymal stem cells that are recruited to the tumor site via endocrine stimulation by tumor-derived factors. This hypothesis is supported by the identification of bone marrow-derived cells within tumors from patients who have previously received gender mis-matched allogenic bone marrow transplantation , although the recruitment of these cells by itself does not indicate functional relevance. However, a recent study demonstrated that certain xenografts 'instigate' the growth and metastasis of weakly tumorigenic cell lines via the activation and recruitment of bone marrow-derived cells . In particular, granulin-expressing bone marrow-derived cells stimulate both tumor progression and the desmoplastic response of resident fibroblasts. These data as well as data from other labs [22–25] support the hypothesis that tumor-derived signals stimulate the bone marrow to produce and emit cells that promote tumor progression. Thus, targeting bone marrow-derived cells may influence the treatment of both localized and metastatic disease. The ECM of breast cancers is markedly abnormal and believed to promote tumor progression. MMPs are a large family of endopeptidases, which are synthesized predominantly by fibroblasts and normally participate in tissue remodeling and wound healing. Besides degrading ECM components, MMPs can also activate chemokines, cytokines, adhesion molecules, and growth factors, which contribute to tumor progression by increasing tumor cell proliferation (such as the release of insulin-like growth factor from ECM by MMP3 and -7) or by promoting angiogenesis (for example, activation of angiogenic factors by MMP1, -2, -9, and -14) . Abnormal physical characteristics of breast tumors, such as abnormal collagen cross-linking resulting in ECM stiffening, also contribute to progression. The forces generated by this stiffening lead to enhanced integrin and growth factor signaling that promotes invasion. Lysyl oxidase, an amine oxidase commonly expressed in breast tumors, promotes collagen cross-linking and enhances ECM stiffening and its inhibition increases tumor latency and decreases tumor burden in the MMTV-Neu model of breast cancer . In addition, elevated expression of lysyl oxidase-like 2 is associated with worse prognosis in early stage estrogen receptor (ER)-negative breast cancers . The link between inflammation and cancer and the importance of infiltrating leukocytes in tumor development are widely accepted, but the mechanisms mediating immune and tumor cell cross-talk are poorly understood. Immune cells are one of the most dynamic cell populations present within tumors and healing wounds and during the remodeling of breast tissue in pregnancy and involution [29, 30]. During physiologic wound healing and breast tissue involution, immune responses are activated, but balanced towards the suppression of overt inflammation, facilitating re-epithelialization and tissue healing [29, 31]. High numbers of infiltrating leukocytes are present in DCIS with focal myoepithelial cell layer disruptions , suggesting that they might play a role in invasive progression. Indeed, several groups have shown that tumor-associated macrophages (TAMs) facilitate angiogenesis, ECM degradation, and tumor invasion through activation of epidermal growth factor receptor signaling, secretion of proteases and paracrine signaling between tumor cells [33, 34]. Loss of macrophages in colony stimulating factor (CSF)-1 deficient mice (Csf1op/op) had no effect on tumor initiation but dramatically reduced malignant progression . To determine whether human breast cancer cells have similar response to macrophages, xenografts derived from human MCF-7 cells in immunodeficient mice were treated with either mouse CSF-1 antisense oligonucleotide or CSF-1 small interfering RNAs. These treatments suppressed mammary tumor growth by decreasing macrophage infiltration, the production of MMPs and vascular endothelial growth factor (VEGF)-A, and endothelial cell proliferation . Cumulatively, these functional studies in mouse models of breast cancer emphasize a prominent role for macrophages during breast cancer progression, and provide a plausible explanation for the association between TAMs and poor clinical prognosis. Besides macrophages, other immune cells have also been implicated in breast cancer development. In a spontaneous mouse model of breast cancer the number of CD4+ regulatory T lymphocytes increased and systemic depletion of T cells using interleukin-2 immunotoxin fusion protein inhibited tumor growth and maintained a strong and persistent anti-tumor immune response . A recent study analyzed tumor-infiltrating CD8+ lymphocytes in breast tumors and found that a higher frequency of these cells in stroma surrounding the tumor was associated with better patient survival . Because these cells are required for cell-mediated immunity, these results may indicate an active anti-tumor immune response against breast tumors, the intensity of which may influence the risk of distant metastatic progression. Although detailed cellular and molecular characterization of the metastatic tumor microenvironment has not been performed, numerous functional studies support a role for tumor epithelial-stromal cell interactions. During metastatic progression, tumor cells encounter and must survive in a number of different microenvironments, such as blood, lymphatics, lymph nodes, and distant organs. The specific destination where the metastatic cell forms metastases may be mediated by the production of chemoattractants, by the local organ and/or the secretion of various products by the primary tumor that can create a favorable environment (Figure 3). Weinberg and colleagues  have shown that MDA-MB-231 xenograft tumors growing on one side of the mouse, termed instigator, mobilized bone marrow precursors via secreting osteopontin to home to secondary metastatic sites, where they promoted the growth of a less malignant cell line. Despite the fact that the mechanism by which osteopontin supported metastasis is not clear, this study not only demonstrates the recruitment of bone marrow-derived cells to metastatic sites but also highlights the systemic effects of primary tumor growth. 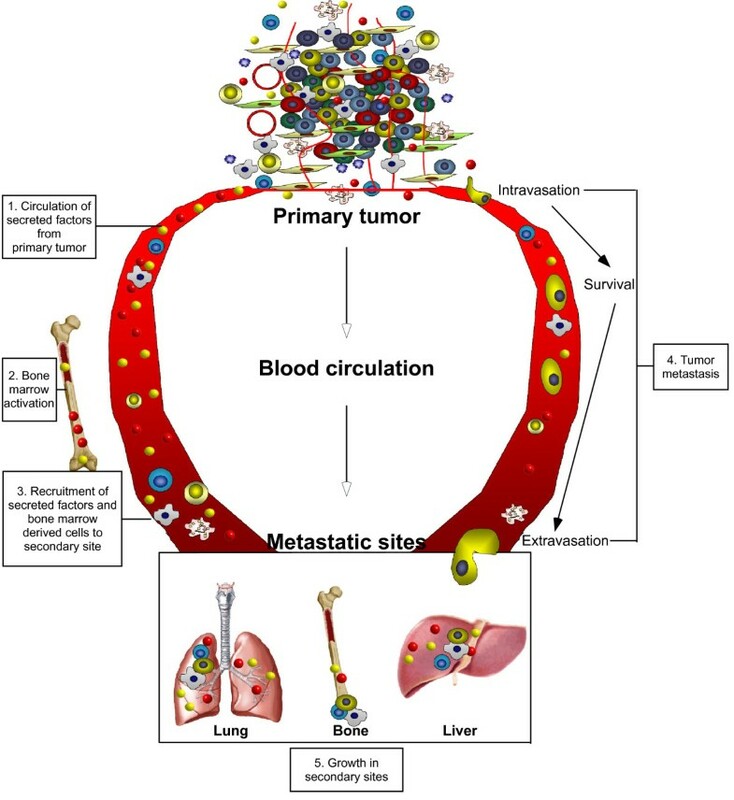 Microenvironment in the metastasis process. Metastasis is a complicated multistep process that requires cancer cells to escape from the primary tumor, survive in the circulation, seed at distant sites and grow. Each step involves stromal cell and paracrine interactions of the microenvironment. Aberrantly secreted chemokines and cytokines from the primary tumor circulate into the blood stream, creating a premetastatic niche even before tumor cell mobilization. Secreted factors functionally activate bone marrow-derived cells, which are then released into the circulation to subsequently incorporate these cells into distant organs, such as lung and liver, to create a favorable microenvironment for the cancer cell to be seeded. For the cancer cells to invade into the blood circulation, proteases are produced by bone marrow-derived cells, including macrophages and fibroblasts. Following tumor cell intravasation, a series of steps is required for the establishment of secondary tumors in the metastatic sites. Disseminated cancer cells preferentially form metastases at sites where activated bone marrow-derived cells are localized and the primary tumor has created a favorable environment at the local organ. After seeding, persistent growth of the metastatic tumor requires the establishment of a vasculature that can be possibly achieved through the production of angiogenic growth factors. In animal models of breast cancer, F4/80+CSF-1R+CD11b+Gr1-CX3CR1highCCR2high and VEGFR1high host macrophages, distinct from classical macrophages, are recruited to metastatic breast cancer cells extravasating in the lungs . In another study, primary tumor-stimulated macrophages increased the metastatic ability of tail-vein injected tumor cells via secretion of MMP9 and VEGF , although lung metastases only developed in mice bearing primary tumors, again indicating systemic effects of tumor growth. A recent study provided another example of how paracrine signals emitted by stromal cells may play important roles in promoting breast cancer metastasis. Receptor activator of nuclear factor-κB (RANK) is highly expressed in human breast carcinoma cells, but the source of RANK ligand (RANKL) and its role in breast cancer metastasis was mostly unknown. In a mouse model of ERBB2-driven mammary tumors, Tan and colleagues  identified a role for RANKL in the formation of lung metastases. Only CD4+ regulatory T cells in the stroma of mammary tumors produced RANKL, which stimulated RANK-expressing ERBB2-driven mammary tumors to metastasize. In addition, most RANKL+ T cells were located adjacent to myofibroblasts expressing T-cell-attracting chemokine CCL5. These studies indicate the possibility that recruitment of distinct populations of leukocytes and stromal cells is required in the process of metastasis. Interest in targeting the microenvironment comes not only from the identification of 'druggable' targets (enzymes and receptors) but also from clinical data demonstrating that stroma-derived gene expression patterns predict clinical outcome. One of the first such studies, by Wang and colleagues , first defined an 'activated fibroblast' gene expression signature that was then analyzed in genome-wide expression data of bulk breast tumor samples from patients with lymph node-negative disease to determine if it has prognostic relevance. A 76-gene signature was identified that predicted shorter distant metastasis-free survival independent of patient age, tumor size, grade, or ER status. The authors proposed that patients with smaller (< 2 cm) tumors and good prognosis based on their signature may not benefit from adjuvant chemotherapy and could be spared associated morbidities . A related fibroblast signature was developed by Chang and colleagues , defined as 'core serum response' genes activated in fibroblasts exposed to serum. Many of the functions of the identified genes were related to wound healing, such as matrix remodeling, myofibroblastic activation, cell proliferation and motility. This gene signature was then validated as a predictor of clinical outcome when applied to expression profiling of whole tumor samples [44, 45]. More recently, investigators have focused on breast tumor stroma-derived gene expression changes. Finak and colleagues  analyzed gene expression changes within tumor stroma and identified 'outcome-linked' clusters that were independent of tumor grade, size, hormone receptor, and lymph node status. The poor outcome cluster was associated with increased expression of hypoxia- and angiogenesis-related genes, whereas the good outcome cluster was enriched for T cell immune responses and natural killer cell markers. The authors derived a 26-gene signature that predicted clinical outcome independent of tumor ER or human epidermal growth factor receptor (HER)2 status, implying distinct stromal subtypes distinct of breast tumor subtype. In a related study, Farmer and colleagues  analyzed the gene expression profiles of reactive tumor stroma from biopsies obtained prior to treatment of ER-negative tumors and derived a signature that predicted clinical response to neoadjuvant chemotherapy. Similarly, Bergamaschi and colleagues  defined several ECM signatures based on gene expression profiling of whole tumor samples that predicted clinical response. In addition to these global profiling studies, individual prognostic markers have also been identified. In DCIS, patients with tumors expressing low levels of CD10 (a myoepithelial cell surface marker) had a higher risk of local relapse . While potentially interesting, small sample size and mixing outcomes from patients treated with mastectomy or lumpectomy limit the validity of the findings. The expression of several CAF-derived proteins is also associated with clinical outcome. For example, high levels of platelet-derived growth factor-β receptor or SDF-1/CXCL12 and decreased caveolin-1 are associated with worse clinical outcome [50–52]. New insights into the tumor microenvironment, both focused and global, are identifying novel therapeutic targets. Currently, three types of tumor microenvironment-targeting therapies are in clinical practice: aromatase inhibitors (which target the aromatase enzyme predominantly expressed by stromal components), angiogenesis-modulating agents (including anti-VEGF receptor antagonists), and inhibitors of HER family receptors (such as trastuzumab, which inhibits receptor signaling on epithelial cells triggered by stroma-produced growth factors). Whereas aromatase inhibitors and trastuzumab have become standard therapy, the clinical effectiveness of angiogenesis inhibitors is less clear . In addition, there is a concern that inhibition of angiogenesis may enhance disease progression based on data in animal models where treatment with anti-angiogenic agents increased invasiveness and metastatic spread [54, 55]. Potential selection for hypoxia-tolerant clones or establishment of leaky, metastasis -promoting vessels could explain these results . In addition to these concerns, bevacizumab, a clinically approved VEGF inhibitor, has been associated with significant adverse reactions, including hemorrhage, neutropenia, gastrointestinal perforation, and thromboembolic events. A recently published meta-analysis of 16 randomized controlled clinical trials administering bevacizumab demonstrated that this agent, when used in combination with chemotherapy, was associated with increased risk of fatal treatment-related adverse events compared to the use of chemotherapy alone . Whereas targeting the tumor microenvironment is an exciting possibility, side effects resulting from disruption of homeostatic functions in normal tissues are very likely, as was demonstrated by the poor tolerability of MMP inhibitors. In the past years, numerous targets have been investigated in early clinical trials, including antibodies targeting FAP, c-Met antagonists and multi-targeted receptor tyrosine kinase inhibitors such as sunitinib [58, 59]. Some of these have been plagued by poor side effect profiles whereas others have been well tolerated, but ineffective. In addition to drugs being developed against novel targets, the anti-tumor effects of several older agents seem to be mediated through microenvironmental actions. For example, bisphosphonates (e.g., zoledronic acid), which are used for the treatment of osteoporosis and the management of bone metastasis, are now recognized to have activity outside of the skeleton, including direct anti-tumor effects on the malignant epithelium, and modulating angiogenesis and immune cell infiltration . Osteoclasts are an important component of the normal bone microenvironment as well as bone metastases. Metastatic tumor cells secrete growth factors that activate osteoclasts, which degrade bone and release additional growth factors, triggering a paracrine cascade that promotes tumor growth and bone destruction. Denosumab is a monoclonal antibody that binds RANKL and inhibits osteoclast function. Recently, denosumab was compared to zoledronic acid in a phase III randomized clinical trial in breast cancer patients with bone metastases . The results of this trial demonstrated that denosumab was well tolerated, and superior to zoledronic acid in delaying time to complications of bone metastases (that is, pathological fractures) but did not improve survival. An important new hypothesis in targeting the tumor microenvironment is the induction of microenvironmental 'reprogramming'. Rolny and colleagues  recently published an intriguing discovery that overexpression of histidine-rich glycoprotein (HRG) in murine syngeneic tumor models induced 'normalization' of TAMs and blood vessel structure. Importantly, this was associated with decreased breast tumor growth and pulmonary metastasis, and increased sensitivity to chemotherapy. The authors demonstrated that the effects of HRG were dependent on the presence of TAMs and in particular TAM conversion from the 'M2' pro-tumor/pro-angiogenic phenotype to the 'M1' anti- tumor/proinflammatory phenotype. In addition, HRG expression was associated with vessel normalization, which was also dependent on TAM activity. This study has linked the phenotypic switching of TAMs by HRG with orchestration of vascular normalization. This effect of HRG on TAMs seems to be mediated through the down-regulation of placental growth factor, though the precise mechanism is unclear. Coussens and colleagues have recently described that the ratio of macrophages to T cells predicts clinical outcome, with increased macrophage recruitment associated with worse outcome . Interestingly, cytotoxic chemotherapy induces the recruitment of TAMs into invasive carcinomas by increasing the expression of CSF-1, a macrophage-recruiting cytokine. Inhibition of TAM recruitment by several approaches increased the efficacy of chemotherapy by decreasing tumor development and metastasis in a CD8+ T cell-dependent manner. The authors postulate that chemotherapy increases TAM recruitment that subsequently modulates T cells, favoring the CD4+ T-cell phenotype, which leads to inhibition of anti-tumor immunity. Inhibition of TAMs promotes CD8+ T-cell recruitment and is associated with increased antitumor immunity. These data support the development of novel compounds that target TAMs and, in concert with cytotoxic chemotherapy, can encourage anti-tumor immunity . Response to chemotherapy can be assessed by changes in tumor size and imaging characteristics as well as histopathological assessment. Tumor growth can progress, stabilize or regress in response to chemotherapy. In the case of a good tumor response characterized by tumor shrinkage, it is possible that the tumor microenvironment actively participates in the tissue remodeling. A simplistic model would be that classic cytotoxic therapies kill tumor cells, which then gives stromal components the opportunity to 'mop up' the necrotic debris. An alternative hypothesis is that the microenvironment, either as a direct effect of chemotherapy or in response to signals derived from the assaulted epithelium, acquires an altered phenotype that independently inhibits tumor growth. Identification of these microenvironmental changes that take place during tumor regression have not been intensively studied. Such studies may identify 'reprogramming' events that can be pharmacologically mimicked with novel, non-cytotoxic agents. Such manipulation of the microenvironment to promote an anti-tumor phenotype in stromal components represents a novel treatment strategy. Metronomic therapy refers to the frequent or continuous administration of low doses of chemotherapy with the goal of eliciting an anti-tumor response while minimizing side effects. Interestingly, metronomic therapies have been implicated in inhibiting angiogenesis, promoting a beneficial immune response and tumor dormancy . The mechanisms by which metronomic therapies influence these changes are largely unknown. One possible explanation is that these chronic therapies are re-modeling the epigenetic landscape of the tumor microenvironment. Just as the epigenetic changes identified in tumors possibly arise from chronic exposure to pro-tumorigenic signals derived from malignant epithelium, one could postulate a similar affect from chronic exposure to anti-neoplastic agents. Epigenetic therapies, such as the histone deacetylase inhibitor suberoylanilide hydroxamic acid (also called vorinostat), are currently under clinical investigation for the treatment of breast cancer. While developed to target the malignant epithelium, their effect on the microenvironment may induce alterations that help orchestrate an anti-tumor response. Currently, there are no reports of the gene expression or epigenetic profiles of tumor samples obtained from patients treated with metronomic therapy or histone deacetylase inhibitors. These data will be valuable to our understanding of the microenvironmental changes induced by these therapies. Besides identifying new therapeutic targets, the microenvironment has also been implicated in chemotherapy resistance. Weaver and colleagues , working with three-dimensional cultures, demonstrated that sensitivity to chemotherapy could be influenced by cellular polarity, which is mediated in part by integrin expression and exposure to basement membrane. Hiscox and colleagues  demonstrated that resistance to fulvestrant, an antiestrogen, promotes an invasive phenotype secondary to increased epithelial expression of c-MET, which is then activated by fibroblast-produced HGF. Loeffer and colleagues  generated an oral vaccine against FAP and studied its effect on the growth of multidrug-resistant breast cancer in murine xenografts. The vaccine decreased tumor collagen I, an ECM component previously implicated in chemotherapy resistance, and tumors from these animals had a significant improvement in chemotherapy uptake as well as decreased tumor growth resulting in increased survival. These data demonstrate that, in addition to promoting progression, the microenvironment can modulate sensitivity or resistance to chemotherapy. Breast cancer remains a major clinical challenge with considerable mortality as well as treatment-associated morbidity. Novel treatment strategies are urgently needed, especially in the setting of metastatic disease where outcomes are still dismal. The breast cancer microenvironment is a complex mixture of cells, the proteins they secrete, and the ECM in which they reside. Alterations within the microenvironment are now recognized during key steps of tumor progression, making them attractive candidates for therapeutic modulation. The relative genomic stability of stromal cells makes the development of chemoresistance to stromal-target therapy less likely. Furthermore, the epigenetic modifications that contribute to phenotypic alterations, while inheritable, are reversible, and there is mounting interest in 'normalizing' the altered stroma, thereby abrogating its tumor-supporting role. One major obstacle facing stromal-targeted therapy is avoiding disruption of homeostatic function in normal tissues. Despite these challenges, our improved understanding of key aspects of tumor progression should lead to treatment strategies that can discriminate normal tissue from neoplasm. How the tumor microenvironment changes during chemotherapy-induced tumor regression is still poorly understood. Insights into these changes may identify important pathways, which can be activated using noncytotoxic therapies. As the mainstay of aggressive forms of breast cancer will continue to rely heavily on cytotoxic therapies for the foreseeable future, agents without these characteristics will be particularly valuable in combination trials. Translating our burgeoning knowledge of microenvironmental influences on tumor progression into clinical practice is challenging. For example, targeting bone marrow-derived mesenchymal cells, which influence both primary tumor growth and the metastatic niche, prior to clinically evident metastatic disease makes intuitive sense. However, testing these potentially important agents in early clinical trials of recurrent or refractory disease may not yield significant improvements in such advanced disease. Thoughtful clinical trial design, including neoadjuvant therapy during which pre- and post-treatment tumor samples can be analyzed, will be vitally important in developing stromal-targeted therapy. Despite these challenges, taken together, the majority of data support the rationale for targeting the tumor microenvironment in the treatment of breast cancer. Andrew E Place, Sung Jin Huh contributed equally to this work. We thank members of the Polyak laboratory for their critical reading of the manuscript and for helpful discussions. KP receives research support and is a consultant to Novartis Pharmaceuticals, Inc.; KP is also a member of the scientific advisory boards of Metamark Genetics Inc., and Theracrine Inc., and owns stocks of Aveo Pharmaceuticals Inc.